Seamless integration is what we all expect when it comes to information technology, especially with migration. However, this is easier said than done. Cloud migration is fairly complicated because it involves so many elements, from picking a suitable operating system (OS) to selecting the best geographical region for our deployments. Migration also involves some standard processes and considerations and is no small feat. Migration strategies differ on a case-by-case basis, however as a whole, cloud migration should be based on best practices from previous examples. An effective migration strategy should maintain a reliable, real-time migration, with less or zero down time. Migration can be broadly categorized into physical to virtual (cloud migration), virtual to virtual (multi-cloud), and virtual to physical (hybrid cloud). Migration can have any combination of these categories. In this article, we are focused on physical to virtual and virtual to virtual migration. Here the target is going to be the Alibaba Cloud platform. This whole process involves Alibaba tools for image conversion, OSS for storage, and some third-party tools to synchronize the data in real time. For a successful migration, the standard process and procedures below are applicable for most organizations. Creating a backup plan – A migration plan is incomplete without a backup plan. There is always a non-zero probability for errors to happen in a migration process, and damage is often irreversible. Schedule migration, notify users if there is any down time expected during cutover. Make a checklist of functions. Post migration testing before moving to production, to ensure all are met in terms of functions, operations. Cloud migration can be perform in two ways: application level migration and virtual machine (VM) migration. The choice is based on the applications running on virtual/physical servers; we may need to plan which one will be best suitable for migration. During migration assessment, we need to check how many applications can support real time migration. For example, Microsoft Exchange can use native DAG; SQL replication tools can be used for database mirroring. Irrespective of any application and platform, it is always better to get an insight from application experts. Typically, a migration expert will create similar infrastructure as the source on the target platform (such as Alibaba Cloud), and then establish a connection using VPN/MPLS to create site-site connection. Some applications can simply be migrated using public IP without VPN. Do real time replication/migration using native methods and switchover. Switchover/cutover requires several steps to be performed by administrators like changing DNS, routing configuration, firewall customization and so on. If there is no available method for application migration, or if the application level migration is complicated, VM migration is an alternative. Also known as image migration, VM migration is the best option for any organization to simplify the migration process. This method is sometimes simply referred to as migrating from a platform to another platform. Alibaba Cloud runs on the KVM/XEN platform, so we need to ensure that it has all required drives to support automation, licensing, and all other cloud dependencies. Irrespective of any source platform Alibaba Cloud has a tool called Alibaba Cloud Migration Tool (Cloud Migration Tool) to perform migration to create ECS instances. Alibaba Cloud invests resources into various categories of image migration to carry out the process with ease and effectiveness. 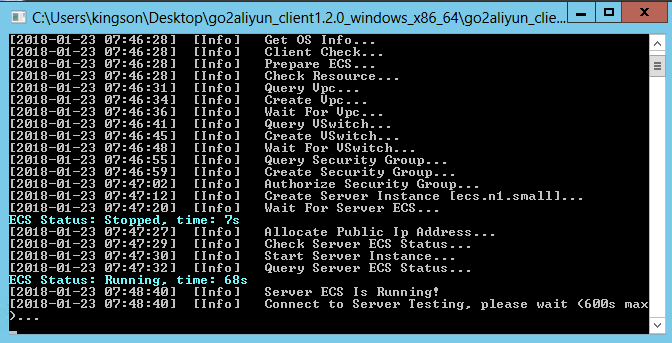 The on-premises server can access the Internet for uninterruptedly transferring data to Alibaba Cloud ECS console. The system time of the on-premises server is synchronized with the real time. Otherwise, an error indicating abnormal TimeStamp is recorded in the migration log file. To enable all the server configuration successfully after the migration, we recommend that you install cloud-init for your on-premises servers. The go2aliyun_client.exe and Rsyncbinrsync.exe programs are not restricted by firewall on the server. The system start loader is normal. Run Alibaba Cloud Migration Tool as an administrator. The go2aliyun_client program is not restricted by firewall on the server. The Rsync library has been installed. oCentOS: Run yum install rsync –y. oUbuntu: Run apt-get install rsync –y. oDebian: Run apt-get install rsync –y. oOther distributions: See the installation documents of the distributions on their official website. The Xen or Kernel-based Virtual Machine (KVM) driver is installed. For more information about how to install a KVM driver, see install virtio driver. SELinux must has been deactivated. You can temporarily deactivate SELinux by running setenforce 0. Run Alibaba Cloud Migration Tool as a root user. If the kernel of your on-premises Linux servers is too old and the version of GRUB (GRand Unified Bootloader) is earlier than 1.9. You may update the boot loader GRUB to a version later than 1.9. For more details refer to this link and refer to below screenshots to validate the process. Below are the steps performed to migrate a simple web server from Azure to Alibaba cloud. 2. Modify as below. Refer to this link for more parameters. To create and obtain new access key, refer here. 3. Save the file and run go2aliyun_client tool as an administrator. 4. You may notice that it creates VPC, Vswitch, Security group all by itself. 5. 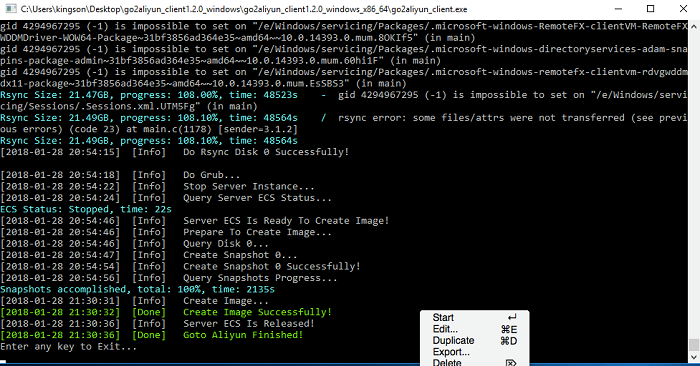 During migration you can see that it creates a new instance named INSTANCE_FOR_GOTOALIYUN. 6. Post sync the same will be exported with the image name that you specified in JSON and the same instance will be released. 7. Below is the screenshot for the new webserver image that was migrated from Azure to Alibaba. After completing the migration, you still need to check whether the migration is 100% successful. To do this, you need to run some tests as listed below. Ensure all services are functioning as expected. Make comparison using functions check list. Ensure that the Windows license is activated by running slmgr.vbs /dlv command in command prompt. Ensure to do all DNS redirection to Alibaba Cloud instance public IP (If required). Make sure to restart servers from cloud portal and monitor the events to confirm if any issues needs an attention. This migration tool supports data disks as well. It doesn’t support incremental sync. If your application requires real-time replication, you may have to consider using native or third-party tools. The same image can also be used to enable Hybrid DR environment. It requires SID correction in active directory environment before joining to the domain. Please note that region level migration within the same Alibaba Cloud account can be achieved by taking a snapshot and sharing the copy to the target region. We hope you found this guide useful. It’s always recommended that you get advice from the experts, to ensure the most suitable approach to make migration as seamless as possible. Did you know you can get $300 of Alibaba Cloud credit just for signing up as a new user, and that you could win up to $3,840 of additional credit? Check out the details over at Alibaba Cloud. Alibaba Cloud Tech Share Author and Alibaba Cloud MVP.